From birth to the age of six children have the ability to effortlessly absorb knowledge and information from their environment and culture. This is the period of child’s self-construction. In a Montessori environment, we encourage individual work to help that process. The following areas of the classroom foster the adaptation and independence. Practical life exercises are designed to help children acquire new real life skills and gain control over their lives. These activities aid in development of concentration, coordination of movement, and attention to detail, since they are done in a sequence of steps. Practical life exercises infuse a sense of care for oneself, for others, and for the environment, as well as the importance of completing a work cycle. They also help development of hand and finger muscles for writing and are preparation for all upcoming academic work. Montessori sensorial materials will provide children with experiences that will help them reach higher levels of intellect. These exercises are allow refinement of motor coordination and enhance visual, auditory, olfactory, gustatory and tactile senses. 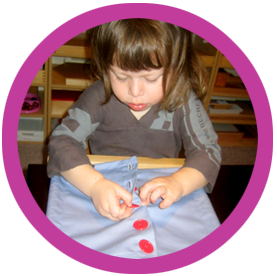 Sensorial exercises serve children in classification and categorization of concepts of size, shape, texture, and color. They familiarize the child with various geometric shapes and concepts as well as language associated with them. The Montessori environment promotes vocabulary development, communication skills, writing and reading readiness. The sandpaper letters aid children in connecting sound and symbol naturally. In the Montessori environment, writing comes before reading, since the children explore with drawing and forming letters. Reading training begins by exploring the sounds that make up words. After a while, the child is able to create words, phrases and sentences. Language materials in the Montessori classroom also include spelling, grammar, creative writing, and oral presentation. Math materials assist children in grasping mathematical concepts by working with concrete materials. The math program incorporates a range of materials that introduce counting, number recognition in addition to the association of quantity and symbol. Children are introduced to the structure and order of the Decimal System, which is followed by mathematical operations: addition, subtraction, multiplication and division, using a variety of materials. In a Montessori classroom geography is introduced at an early age. Children work with puzzle maps and begin to learn the names of continents, oceans, countries, their flags and people. They learn to appreciate their own cultural traditions and those of their friends. Observing and exploring nature and the outdoor environment promotes an interest in science and a respect for the natural world and life. Through Music and Art the children have an opportunity to express their joy and creativity. In a Montessori classroom they have a chance to experience different aspects of art and listen to the sound of great music. The children love it and enthusiastically participate.